The Panel Array Antenna is your go-to solution for cutting through wireless interference in crowded environments. When attached to a Bolt 1000 or 3000, the antenna provides an extremely robust directional signal that will ensure your signal arrives uninterrupted. Comes with the Teradek Antenna Array and a Protective SKB Case with custom foam. The custom foam was designed to accommodate the Antenna Array, 1 Bolt Transmitter and up to 2 Bolt Receivers. 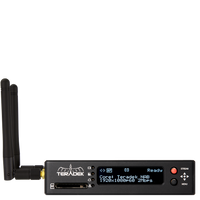 The Teradek Array is a 5GHz MIMO panel antenna designed for use with Beam, Bolt 600, 1000, 2000, 3000 Receivers (Bolt Transmitters, Bolt 300 and Sidekick are not supported). The Array offers a more resilient wireless transmission, especially in challenging RF conditions, by focusing the signal and reducing interference. As a result, you may achieve a boost in the reception range but it will not be above the maximum range. The Teradek Protective SKB Case is an injection molded Military-Standard Waterproof Case molded of ultra high-strength polypropylene copolymer resin, featuring a gasketed, water and dust tight, submersible design that is resistant to corrosion and impact damage. Features a molded-in hinge, patented trigger release latch system, comfortable, snap-down rubber over-molded cushion grip handle, automatic ambient pressure equalization valve, resistance to UV, solvents, corrosion, fungus and impact damage.